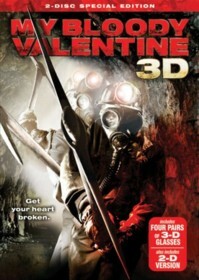 My Bloody Valentine 3D is a Horror movie starring Jensen Ackles, Kerr Smith, and Jaime King. The movie was directed by Patrick Lussier and released by the Lionsgate studio on 2009-01-16. The movie has an MPAA Rating of R (Restricted). Our users found the overall impression of this film to be Scary. The movie's official site can be found at www.mybloodyvalentine3ddvd.com. An okay slasher horror film that has a few absurd moments. This was kind of a so so experience. On the one hand the basic concept was pretty interesting but the execution kind of went a bit wonky along the way. The movies plot without spoilers is about a miner named Harry Warden (Richard John Walters) who after training a rookie (Tom Hanniger) (acted by Jensen Ackles who happens to be the mine owners son) to operate some valves causes a mine explosion and causes the miner Harry to end up in a coma in the hospital. On Valentines day Harry wakes from his coma only to go on a violent rampage killing everyone while dressed in a miners suit (quite brutally) in the hospital only to be shot himself later on by some bumbling cops. This is the premise the movie is based on..the movie itself takes this premise and created the movie reviewed here which is kind of a sequel to the classic or not so classic 80s movie of the same name. This movie tells the story of how many years later (also on valentines day) killings are happening again and how everyone thinks that Harry is back. I would say this movie is only a rental if you cant find anything else in the Horror section to watch..be warned though it is a pretty violent and graphic movie so it is definitely not for the faint of heart.